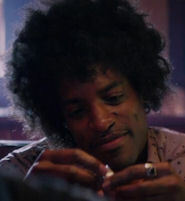 The Seattle International Film Festival has announced that the Opening Night Film for its 40th annual festival will be “All Is By My Side.” Musician/actor André Benjamin stars as Seattle rock legend Jimi Hendrix in this film from Academy Award-winning screenwriter John Ridley (“12 Years a Slave”). Ridley is scheduled to attend the Opening Night festivities on Thursday, May 15. It’s 1966 and James Hendrix is an unknown backup guitarist in New York City. One night, Linda Keith (rising British talent Imogen Poots) — girlfriend to Rolling Stones guitarist Keith Richards — happens to catch a set he’s playing and, mesmerized by his skills, brings Hendrix into her inner circle in London. There, Hendrix has the freedom to develop his craft and personal style. Before long, however, Hendrix finds himself caught between Linda’s protective grasp and the charms of a new admirer (Hayley Atwell). With these two women by his side, Jimi, as he is now known, navigates the London music scene and begins to make his mark in the world of rock ‘n’ roll — and the rest is history. Ridley, who also wrote and executive produced the film, has crafted a daring, wholly original interpretation of an artist’s origins, perfectly blending his story with archival footage of the era. Benjamin’s magnetic, nuanced performance is the beating heart of “All Is By My Side” The result is an intimate portrait of the early, momentous years in the life of the legendary guitarist. The film will be released in theaters this summer by XLrator Media with Open Road Films. You can see the first clip from the movie by clicking HERE. The Opening Night Gala will take place on May 15 at McCaw Hall, with the after-party held next door at Seattle Center’s Exhibition Hall. With an expected attendance of 3,000, it’s Seattle’s most exciting party. General admission tickets and Red Carpet Experience tickets are available for purchase at SIFF.net or by calling the SIFF box office at 206-324-9996.
at venues in Seattle and around the Northwest.